When organic particles sink from the surface ocean to the seafloor, a small but significant proportion of atmospheric carbon is stored away. Adriana Dutkiewicz and colleagues at the University of Sydney and Data61/CSIRO have now used global data sets collected over decades combined with cutting-edge big data analysis to understand how this process depends on surface ocean environments. Their new analysis shows that narrow ranges in sea-surface salinity and temperature are controlling the growth and composition of microscopic organisms in surface waters and their ultimate deposition on the seafloor. This is important because both parameters may be changing significantly in a warmer future ocean, with additional influx of meltwater from icesheets. The paper entitled “Controls on the distribution of deep-sea sediments” has been published in Geochemistry, Geophysics, Geosystems this week. The deep ocean floor is made up of the remains of microscopic sea creatures that live in sunlit surface waters. They produce more than 25% of the oxygen we breathe and form the Earth’s largest carbon sink, but our knowledge of how this “carbon pump” works is still sketchy. Microscopic organisms that live in the surface ocean fall to the seabed as “marine snow” after they die. They were assumed to depend on a large variety of ocean conditions, including the supply of a diversity of nutrients, temperature, salinity, and water depth. Dr. Dutkiewicz said: “To our surprise, we found that the occurrence of most deep ocean sediment types depends mainly on just two, or at most three, key parameters”. 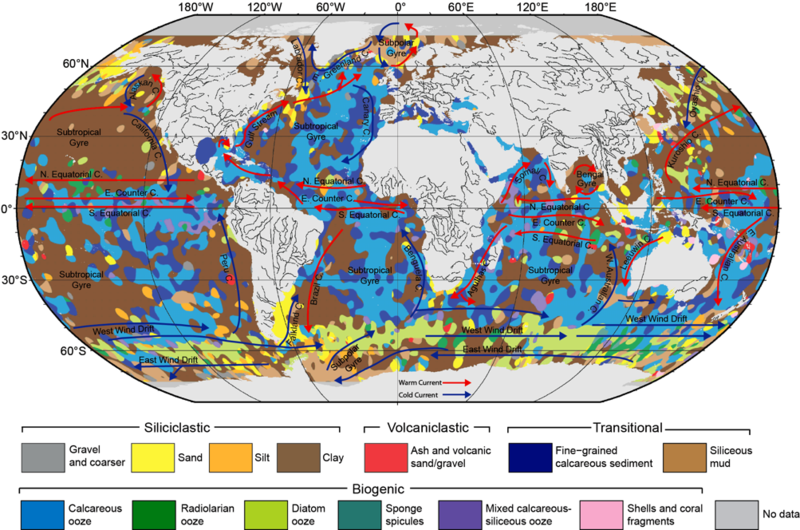 The study provides a new framework for reconstructing surface ocean environments from the geological record of deep-sea sediments. They contain abundant evidence of the ways in which Earth’s climate has changed in the past and are a key to understanding how it may change in the future. The paper, Controls on the distribution of deep-sea sediments, is available to download here.